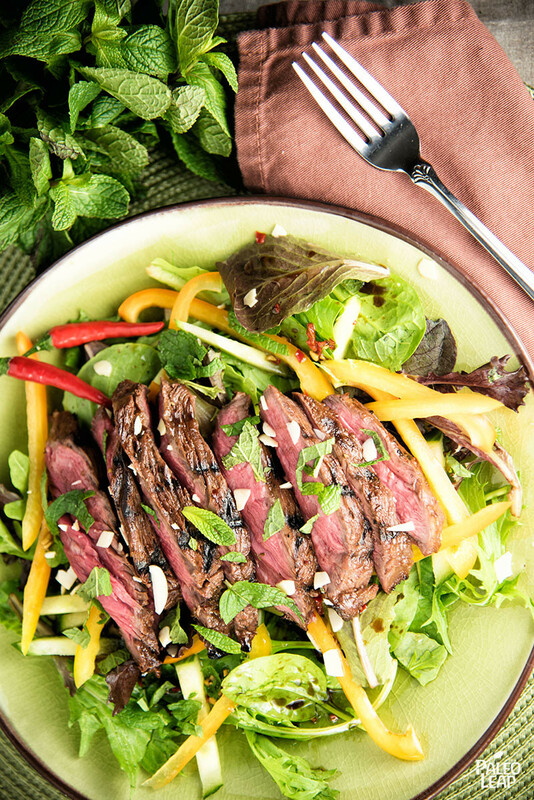 Steak salad, meet Thai flavor. This tweak on a classic features lettuce and bell peppers…and red chili, ginger, lime juice, and fish sauce. And the dressing is a great tweak on a classic vinaigrette – coconut oil instead of olive, and a blend of lime juice, fish sauce, and coconut aminos to give it a fresh, Asian flavor. It’s a little more time-consuming than just throwing the steak on top of any old pile of greens, but the result is worth it. If you want, you could manage the cooking time by putting the steak to marinate overnight – that gives you a little more leeway about starting time on the actual day you plan to eat the salad. The coconut aminos are pretty central to this recipe. If you’ve never had them before, think “Paleo soy sauce,” but made from coconut. (Is there anything coconut can’t do?) You can find them at health food stores or sometimes in either the gluten-free or the ethnic section of regular grocery stores, and if you don’t have either, they’re also available online. Even though this is a salad inspired by Thai cuisine, the rest of the ingredients shouldn’t be difficult at all to find, and all of them should be in any big grocery store, waiting for you to take them home and make them into something good. SERVES: 4 PREP: 1 h. COOK: 15 min. In a bowl, prepare the marinade by mixing the ginger, garlic, red chili, lime juice, and coconut aminos. Place the steak in a marinating container. Cover with the marinade, and marinate 30 minutes to 1 hour. In a bowl, combine all of the ingredients for the Thai dressing, and whisk until well-emulsified. 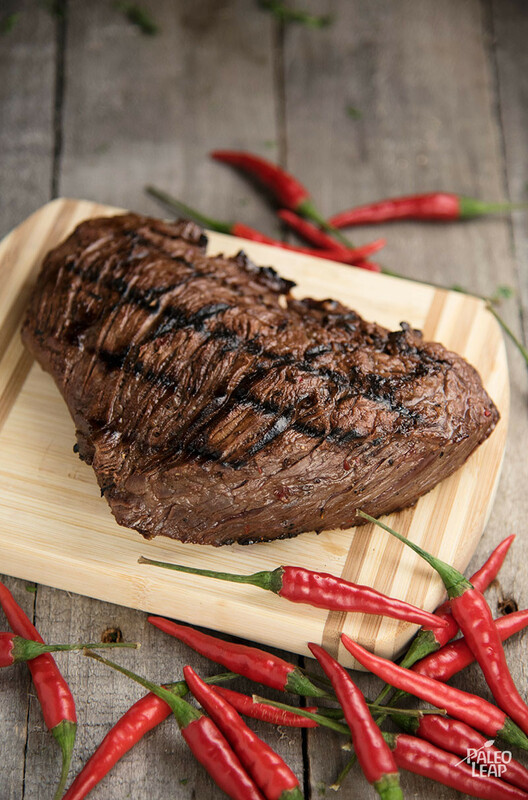 Grill the steak 3 to 4 minutes per side on the preheated grill. Set aside, let rest for 3 to 4 minutes, and slice. In a salad bowl toss together the lettuce, bell pepper, and cucumber. Drizzle the dressing on top and toss gently again. Arrange the vegetables on different plates and top with the sliced steak. Top with fresh mint, slivered almonds, and cilantro.